The Imagineers have taken flight on the motorized scooter craze that’s sweeping over Atlanta. Our office is located a block away from Ponce City Market, a centralized location with lots of trendy spots nearby. With the introduction of e-scooters like Bird and Lime, the Imagineers have become even more mobile and it’s been fun to see how these motorized scooters have changed our professional means of transportation. Most professionals might be familiar with core values as a list of abstract words that get posted on the wall in your office, introduced to you during your orientation and then never heard of again. At Imagine Media we approach our core values with sincerity and they are part of our daily conversations, celebrations and goals. This is why it was huge news last week when our leadership team announced that we were going to make some changes to our core values. The updates included shortening the descriptions of each core value in order to make them more memorable and changing our I-word from “Innovative” to “Integrity.” Given that we live and breathe these core values, it was very important to our leadership team to know that these were still values that resonated with us as a whole. The team was excited about these small, but mighty changes to our guiding truths. So how do we put these values into practice? Check out this list of ways that the Imagine Media team incorporates core values into our everyday processes and long term goals. Everything you put out into the world from your brand’s social media builds the personality of your company – that is your brand's voice! Creating a brand voice is imperative because a it helps solidify the purpose and motivation behind a business. It’s how you connect with your audience and keep them coming back to you. Here are some tips on how to guarantee you get your brand voice across in the way you want. It is essential to know your brand inside and out to create a good brand voice. You need find out its personality - funny, quirky, professional, matter-of-fact. This choice will depend on how you want an audience to perceive your brand. An easy way to start is by choosing a few adjectives to describe what your brand is, and what your brand is not. Be as specific as you can. Examples include: confident but humble, social but not boisterous, clever but not sarcastic. Essentially, you are building who you are as a brand and giving viewers a reason that sets you apart from the competition. In short: define your voice, then keep it consistent. This one seems fairly simple, but it is something easily overlooked. You need to understand your target audience, who you are trying to reach and what they care about. Speak in way that is relevant to them, and in ways they want to receive the information. For example, would it be more effective to reach someone in your target via a native advertising article or a short funny clip? While it is important to strategize in creating your brand voice, be careful that you do not sacrifice authenticity. Though using other brands as inspiration for creating your own in the beginning can be a great jumping off point, you do not want to be something you are not. If you lose what makes you unique, it comes off as fake or trying too hard to an audience and it will show through. You want to give an audience a personal look at your brand, and being fake or unauthentic will not get you the audience you want. Every brand should be willing to open up and relax. Regardless of what your brand voice is, authenticity is key. The final important part of brand voice is to just keep moving forward. If you do not get a solid brand voice right away, that’s okay, just keep trying until you figure out what you are going for. Brand voice is like language, it is fluid. It changes and adapts at every stage of a brand’s life cycle. Because our world is ever-changing, as a brand you need to be adaptable and be a lifelong-learner. Ultimately, never be “finished” creating your brand voice. Meet Hannah, one of our Social Media Ambassadors!Hannah is so excited to join the Imagine team this summer! She is currently a rising junior at James Madison University studying communication studies with a concentration in public relations. She is a Marietta native always looking for a reason to spend more time in the city. When looking for a summer job, Hannah was searching for a place where she could learn, grow, and get back to the South. Hannah attends school in Virginia and couldn't wait to come back to the warmer weather this summer. When she discovered Imagine Media, she knew it was the perfect fit! Hannah values hard work, organization, and creativity. She loves to get the job done and challenge herself! This summer she is excited to learn and collaborate with the team and other ambassadors. When she is not working, Hannah loves spending time in the water. She is a student-athlete at JMU where she is a member of the swim team. 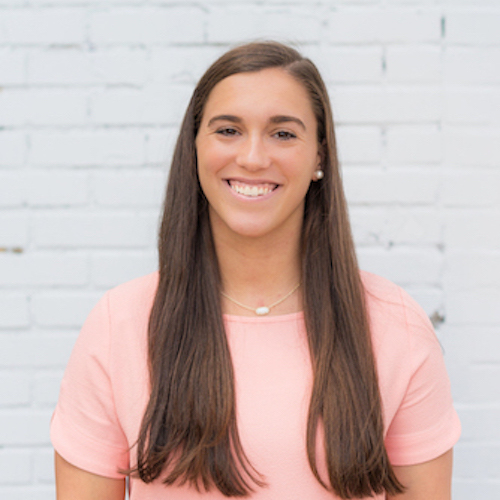 When Hannah is spending time "on land," she is eating Mexican food, watching her favorite television series, or cheering on her favorite sports teams.